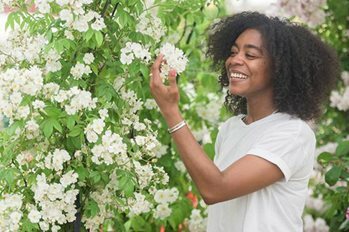 The Discovery Zone, which offered the chance to get up close and personal with a wide variety of educational exhibits, returned to the Great Pavilion at Chelsea Flower Show, sponsored by M&G Investments. From the increasing threat posed by pests and diseases to the benefits of bees and take-home urban inspiration, the Discovery Zone addressed topical issues and poses potential solutions. The Zone also recognised and payed homage to significant anniversaries, including a decade of Help for Heroes, 50 years of Capel Manor College, and a 70th anniversary celebration of the voyage of the famous HMT Empire Windrush, from the Caribbean to Tilbury Docks. The Animal and Plant Health Agency (APHA) highlights the importance of oak trees and the iconic part they play across the British countryside, making up 16% of our broadleaf woodland and supporting more than 2,000 other species. Air and soil pollutants, pests and diseases and changing weather patterns are threatening British oaks. The interactive display highlighted how we can protect the trees for future generations. Over the past 25 years, Bees for Development has helped some of the poorest people in the world to keep bees and break out of poverty by using honey and beeswax to create income to pay for food and education. The initiative gives young people without land or opportunity the chance to create a sustainable livelihood. Examples of the charity’s work across the globe were on display, from their beehives in Africa to ‘Bee Houses’ designed for gardens around the UK, each of which can house up to 50,000 honey bees. Birmingham City Council, who have exhibited in the Great Pavilion with consecutive Gold medals since 2011, made their Discovery Zone debut with a vibrant display in celebration of the 70th anniversary of the voyage of HMT Empire Windrush from the Caribbean to Tilbury in Essex. Working with RHS Ambassador, Baroness Floella Benjamin, the exhibit portrayed the personal experiences of people moving from the Caribbean to start a new life in Britain, featuring a mixture of plants from both regions and demonstrating the important part allotments played in helping different communities to integrate. Indoor Garden Design’s (IGD) second co-creation with Ikea demonstrated a range of houseplants creatively displayed within a home office environment. This provided information on how 'greening up' workspaces can significantly improve productivity. #plantswork explains the benefits plants offer when used in an office setting and aims to show how Biophilia - the suggestion that there's an instinctive bond between human beings and other living systems - works to improve our wellbeing by connecting us with nature. 'The Force for Good' by Sparsholt College highlighted the positive experiences that horticultural therapy has on individuals going through recovery, supported by the Help for Heroes charity. Celebrating its 10th anniversary, Help for Heroes hopes the exhibit will demonstrate how gardening can aid physical recovery and improve mental health for all. Celebrating their 50th (golden) anniversary, leading environmental college Capel Manor College explored how the colour yellow is important in pollination and why breeders prize the colour, looking in detail at the role of pigments and exploring the science behind yellow in the Plant Kingdom. The display featured 50 different yellow plants including trees, shrubs, herbaceous, grasses and bulbs. ​The River of Flowers' Honeycomb Meadow Bee Garden was designed to bring a meadow to the heart of the city. Constructed using mobile and interlinking hexagonal planters, it appears to 'float' over barren urban spaces, covering them with nectar-rich wildflowers to feed bees and other pollinators. A first-time exhibit from Vegepods featured fully contained, self-watering, efficient, organic raised gardens, educating visitors on the importance and principles of urban farming. The Horticultural Trades Association (HTA) presented ‘The Great Escape’, full of take-home inspiration to transform any outdoor space into a multitude of escapes, from a gym, to a kitchen, to a place of pure beauty and serenity. Visitors were invited to come along and visit the ‘Weed Clinic’ hosted by the Property Care Association, providing advice and a better understanding of how to manage those invasive non-native plants, desired and undesired, found in our gardens. What else is on in the Great Pavilion?